Philadelphia 76ers general manager Elton Brand speaks to the media during a press conference at the Philadelphia 76ers Training Complex. Section 115 at the Wells Fargo Center is positioned adjacent to 76ers general manager Elton Brand’s regular courtside seat on the baseline of the visitor’s side. It’s an area that is not exactly sound proof. White noise tends to seep through. So, when Brand was sitting through the Toronto Raptors’ thumping of the 76ers, 119-107 on Tuesday, February 5, Brand heard the full brunt of the Sixers’ fans. He heard that fan loud and clear. And in doing so, Brand has made himself a very viable candidate for NBA Executive of the Year. Out went Landry Shamet, Mike Muscala, Wilson Chandler, and Markelle Fultz. In arrived Tobias Harris, Boban Marjanovic, Mike Scott, James Ennis, and Jonathon Simmons. Not to mention the earlier acquisition of all-star Jimmy Butler in November. In came hope; out went the pessimism that the Sixers’ previous incarnation had a ceiling of reaching the Eastern Conference finals. If Brand won the NBA Executive of the Year award, he would be making history. No 76ers’ executive has ever won the NBA Executive of the Year award, which has been in existence since the 1972-73 season (Jerry Colangelo, former Sixers’ chairman of basketball operations, won it four times and his son, Bryan Colangelo, won it twice, though neither with the 76ers). In a six-month span as Sixers’ GM, Brand has transformed the 76ers from being Eastern Conference contenders to NBA championship contenders. He’s enlivened a franchise and a fanbase that’s been patiently waiting for this time to arrive. After a 108-92 win over the New York Knicks this time last year, the Sixers starting five was: Joel Embiid, Dario Saric, J.J. Redick, Ben Simmons and Robert Covington. Entering the Sixers’ Atlantic Division showdown with the Boston Celtics Tuesday, it will likely be: Embiid, Simmons, Redick, Harris and Butler. After 56 games last year, the Sixers were 31-25. After 56 games this year, they’re 36-20 and 5.5 games behind the Eastern Conference-leading Milwaukee Bucks going into games as of Monday, Feb. 11. 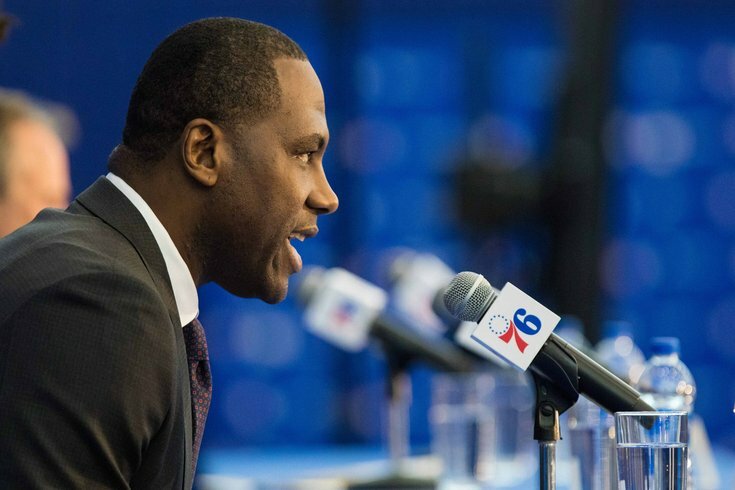 “I don’t think anyone realized how fast, and how smart, and how good Elton Brand is at this job,” 76ers’ President Chris Heck said. “He’s proven everyone wrong and he’s gone beyond imagination on how quickly he’s picked things up on being top of the class in the NBA. Heck adroitly pointed out that Brand has been part of the Sixers’ staff during the Bryan Colangelo years, with Colangelo holdovers Alex Rucker, executive vice-president of basketball operations, and Ned Cohen, assistant general manager. “It’s not a new operation, it’s just new leadership and I think Elton brings an additional element that no team in the NBA has seen — and that is, here’s a guy that just got off the bench playing a couple of year ago, but someone could be that qualified to do this?” Heck asked. “Somehow, someway, we found the right guy. When you have a GM who is a relentless worker that has your back and knows what he’s doing, you can’t ask for more than that. It’s a question that Brand himself personally backed away from. He still thinks he has more to do. “I do,” Brand said. “There’s still a lot of time left in this season and we have to produce. I wouldn’t be here and none of this would have gotten done without great preparation, with a great staff and a great group. I can’t take credit for it. I won’t take credit for it. “I work with great people. It’s helping having their input and their support. I think the moves that we’ve recently made make us a better basketball team and we’re certainly in position to win it. As a manager in leading people, I think I’ve grown a lot in six months. On Friday night, as the 76ers were chewing up the Northwest Division-leading Denver Nuggets, 117-110, Section 115, where all of the unflattering clamor was coming from just three nights before, was bellowing praise for “E-Trade,” Elton Brand. Fans were chanting, “Thank you, Elton! Thank you, Elton!” with 9:18 left in the first quarter. With 4:04 left in the first quarter, with the Sixers leading, 20-16, Brand even got praise from the man selling cotton candy. As Brand left the court up the steps of Section 115 after the first quarter, fans extended hands and points in his direction. He couldn’t take two steps without being stopping to take a picture or sign a program. Now all that’s left is for the Sixers to win. Sixers’ guard T.J. McConnell has been through the rough times with this franchise. It’s nice to know they weren’t for nothing. “Elton is a relentless, tireless worker, and what more can you ask for from your general manager,” McConnell said. “The thing is, Elton has our backs. He knows what players go through, especially when you’re losing. When you have a GM who is a relentless worker that has your back and knows what he’s doing, you can’t ask for more than that.